Sandbanks Beach is undoubtedly the BEST beach on the South Coast of England …. Some would say in Britain ! Sandbanks itself is a small peninsula, which contains some of the most expensive houses and land in the country, in fact Sandbanks is becoming as famous for its well know residents and lavish lifestyles of some of its occupants as it is for its beach. For those seeking the ultimate in beach life style, some of the most exclusive houses boast direct access onto the beach and stunning sea views. 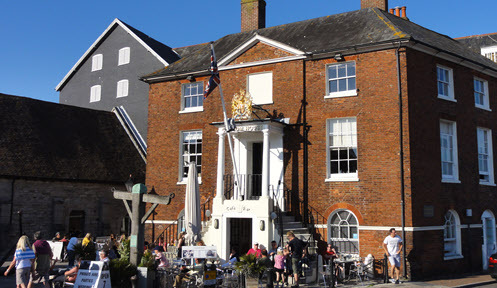 For visitors there are several top hotels in the Sandbanks area, including the Haven Hotel and the Sandbanks Hotel as well as numerous rental properties and apartments. 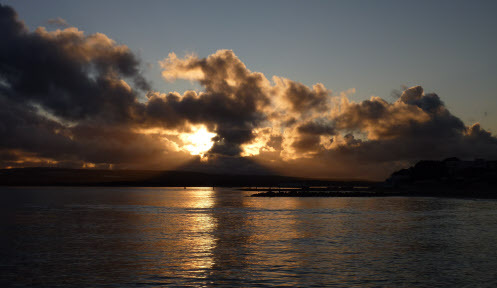 The area is well served by restaurants including the famous Café Shore . 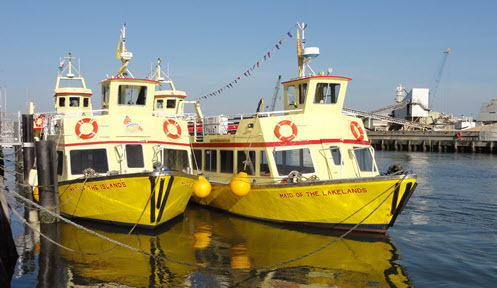 One of the most famous and unique attractions of Sandbanks is the Sandbanks Chain Ferry , which shuttles between Sandbanks and Studland crossing at the mouth of Poole harbour. A holder of the European Blue Flag again in 2013 for a record 26 years, Sandbanks Beach in Poole is a beach of the highest quality that you can visit in total safety and be sure that you and your family and friends will have an excellent time. The beach is of the finest quality with fine golden sand. The beach meets all of the European standards. The water is clean and safe, although it may sometimes be on the cool side ! The beaches fine and golden sand gradually slopes away into the water ensuring it is safe for even the smallest of children. There are Lifeguards on duty during the main season ( 1 May – 30 Sept) and there is also a First Aid post if required. There is a large car park at Sandbanks and also on-road parking. The charges made in the car park and for on-road parking are quite high although you are parking right on the beach so you don't have too far to carry all of your beach equipment. As you would expect, when the weather is fine, the car park fills up very quickly. 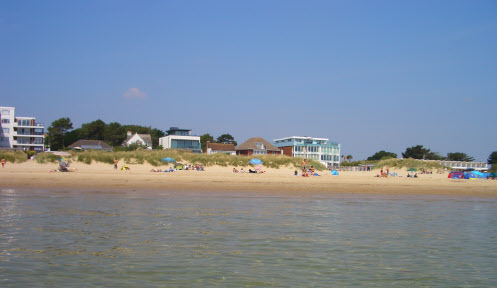 There are some very good facilities at Sandbanks including toilets (with full disabled facilities) , showers, ice-cream kiosk and hot-dog/burger bars as well as the Sandbanks Beach Café which offers a selection of hot and cold meals and drinks throughout the year. There are also several kiosks and shops selling all the usual beach goodies such as inflatables, buckets and spades etc. There is a large and challenging crazy-golf course behind the beach front as well as a mini-golf course. There is also a mini road train that cruises up and down the prom in the summer season. There is a wide selection of watersports available from the beach including parascending, inflatables, “Bronco's” or “Ringos”, kayaks, jet-ski hire and much more. The facilities offered does vary so all options may not be available, so check what is available when you visit. 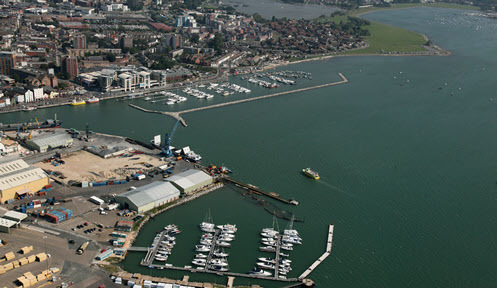 If you're looking for watersports equipment of coaching whilst visiting Poole,check out our WaterSports Page for the latest information and offers. BBQ's – There is a designated area on Sandbanks Beach for BBQ's, with raised areas. Please ensure if you have a BBQ you tidy up after and leave the beach in a safe condition. Lost Property – Any items found should be handed into the Beach Office, where they are retained until the end of the summer season. Dogs – Between 1 May – 30 September dogs are forbidden on the majority of Pooles beaches for reasons of health and safety. At Sandbanks there is a designated dog walking/exercise area to the west of the promenade (towards Sandbanks Ferry). During the winter, from 1 October – 30 April, dogs are allowed on all Poole beaches. Beach Safety – Read our brief beach safety guide.